A jade bi disc of circular form with a round aperture in the centre. Each side of the disc is carved in low relief and openwork design with chi dragons of different sizes entwined with each other. Their sinuous bodies with sprawling limbs and elongated tails cover the entire disc. The stone is of predominantly yellowish celadon tone with areas of brown inclusions all over and a few white veins. Some calcified areas are visible. A small hole drilled underneath one of the dragonheads has been filled with a bronze fitting, which has corroded to a green colour. 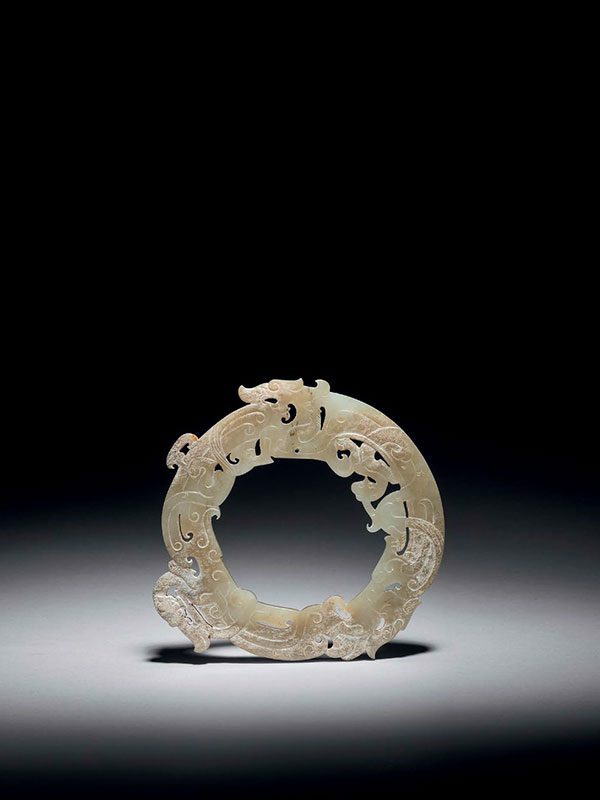 This exquisitely carved circular jade huan was originally a component part of a set of pendants, strung in rows with beads and huang of arched form. Together they would have hung from the waist or the shoulders, creating a tingling sound when worn. Such jade pendants were considered emblems of virtue and were recognised as a sign of rank. A jade huan of similar size and closely comparable in design with two dragons in openwork carving, dated to the Warring States period (475 – 221 BC), was excavated from Tomb no. 1 at Shangwangcun, Linzi, Shandong province and is now in the Zibo Museum at Shandong (fig. 1). Two comparable jade huan with dragons carved in relief and in openwork design, and forming part of a pendant set of jade ornaments, were excavated from the tomb of the King of Nanyue. These can be dated to the Western Han dynasty (206 BC- 9 AD), and are now in the eponymous museum in Guangzhou. A smaller Han dynasty circular jade pendant with closely comparable dragon carving in relief is in the collection of the Palace Museum, Beijing. A further comparable jade pendant with openwork design of kui dragons, excavated from the tomb of King Cuo, of the State of Zhongshan of the Warring States period (475 – 221 BC), is in the collection of the Hebei Provincial Museum.